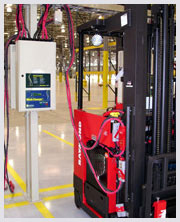 Minit-Charger is built to handle the "heavy lift." In head-to-head demonstrations with competitors, Minit-Charger's Adaptive Charge Control technology routinely exhibits a higher safe charge rate for a longer period of time as the battery charges. Minit-Charger's Multi-Station Priority Charge technology allows customers to reduce connected electrical load and circuit installation costs while maximizing charge return to the fleet battery. Finally, every Minit-Charger comes with Minit-Trak, the industry leading data logging and analysis tool. Minit-Trak keeps you informed as to truck, battery and charger performance to allow evaluation and decisions based on facts. 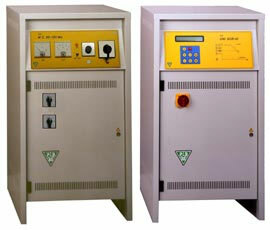 All three technologies are unique to Minit-Charger and are proven in commercial operations since 1998. Click here to view "50 Answers for the Most Frequent Comments on Fast Charging"
Multi-voltage chargers suitable for all type of batteries. Programming and display of the charging cycle by means of a keyboard and multifunction display.